Like most writers and entrepreneurs, I have a bulging to-do list. It’s like a bottomless cup of coffee; it stimulates, comforts and raises blood pressure all at once. My to-do list runs my life. I've tried many different options from Outlook flags to via my iPhone with TaskTask. At the moment, I'm really learning to love Taco. Really love it. It's one of those brilliant tools for writers. It does two important things. First, it pulls in tasks and to-dos from all the apps I already use and displays them in one place. It supports a ton of apps. 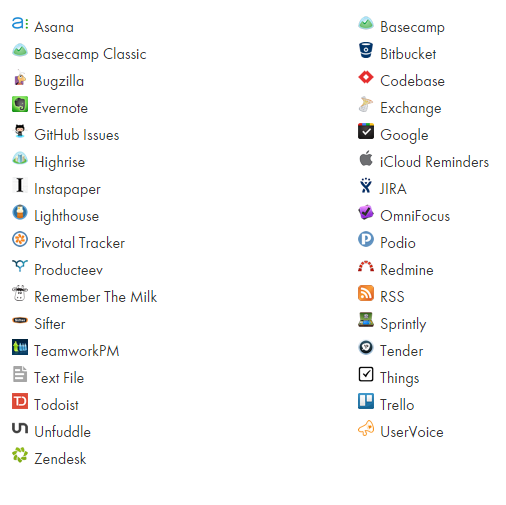 I use it with Basecamp, Zendesk, Office 365 and Salesforce. So, instead of four open windows, I have one for all my tasks. The second, and in many ways more important, thing that Taco does is make it easy to prioritise your tasks and focus only on the few tasks that matter today. It has two columns: ‘for later’ and ‘up next’. You can drag items from one column to another and up and down within the columns. Hide the ‘for later’ column for a short list of the stuff that matters now. This is the answer to task-anxiety. Instead of drowning in dozens or hundreds of tasks, now you know that you have all of them in sight and that you’re focusing on the top priorities (and temporarily hiding the rest). If you use more than one app to store tasks and you have more tasks than time to do them, then you need Taco. It’s a nice idea. A bit of a dream, really. It is the complete opposite of my way of working. It’s about being rather than doing and it has an attractive Zen in-the-moment flavour to it. But it’s also impractical. My clients wouldn’t thank me if I missed my deadlines because I decided to do somebody else’s work first. To-do lists help me prioritise, schedule and filter. It’s good to concentrate on one thing at a time but it’s also essential to pick the right thing. But it did make me ask if my to-do list was too much at the mercy of other people. Things other people want me to do rather than things I want to do. Things I am excited about. It’s got me thinking and I’d really like to get some feedback from other people? So, dear reader, how do you manage your life? Is it to do or to be? How do you balance your passions with your duties? What tools do you use? Do you have a ‘system’? Is it useful? Jason Fried on getting it done: is office culture destroying productivity?